Offensive linemen often take pride in doing their job despite not getting the type of praise usually reserved for the skill guys scoring touchdowns, but few linemen actually have the option to choose. 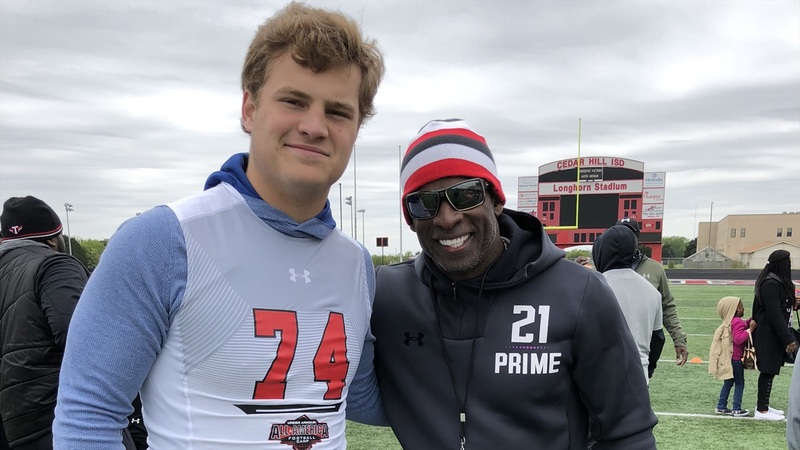 Eli Acker‍ is one who did and the 2020 Mississippi prospect made the choice to do what would help his team most. Harrison said they “kind of knew” he was going to end up being an offensive tackle in the end, but entering the 2017 season, they left the decision up to Acker, who was about 6-4, 225 as a freshman and in the midst of a growth spurt during his sophomore year. “He decided to stay at tight end, which was fine with us,” the coach said. “But probably about Week 4, we kind of struggled up front, and he came to me and said, ‘Look, I think I need to move to tackle. I think it could help the team.’ He’s been there ever since. Acker is now checking in as a 6-foot-6, 270-pound junior. Back in May, Acker committed to Ole Miss, but he’s keeping his options open. Part of that process is taking other trips and Acker will be at Notre Dame this weekend for the Irish’s home finale against Florida State. The coach said Acker is “really excited” about the trip. Harrison called Acker a “great kid” away from the field. In addition to Notre Dame, Acker is also hearing from schools like Purdue, Memphis and Vanderbilt among others.